You could be forgiven for thinking Google was new to wireless charging if you haven’t been obsessively following its products for years. The Nexus 4, 5, and 6 all had wireless charging capabilities, and Google even released its own wireless charging pad in 2013. After ignoring wireless charging for several years, the feature is back on the Pixel 3 and 3 XL. 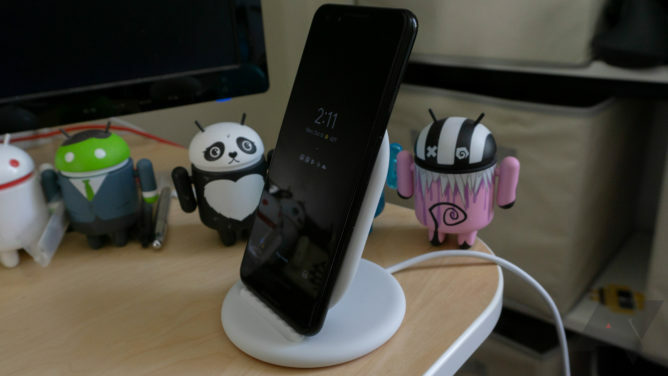 Google is also selling a wireless charger again: the Pixel Stand. Not a whole lot has changed in the last five+ years. Google’s official wireless charger costs more than the competition, and it has an unusual design. However, the Pixel Stand includes some genuinely cool technology, and it integrates tightly with the Pixel 3. You probably don’t need those features, though. It’s tough to justify $79 for the Stand when you can get a Qi-compatible pad that charges your phone just as well for $20. 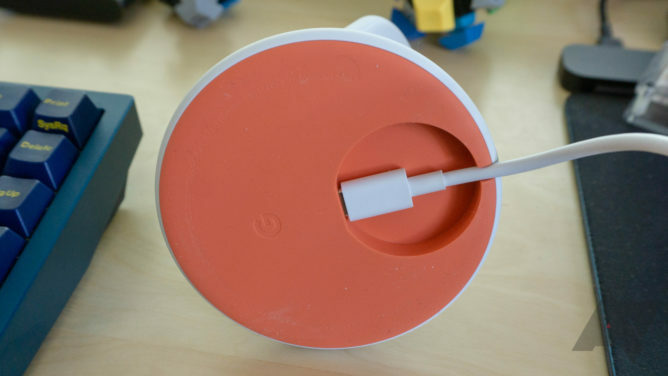 The Pixel Stand is the ultimate minimalist deconstruction of what a charging stand can be. There’s a flat circular base, an oval-shaped back to support the phone, and a small lip to hold the phone in place. That’s it. The Pixel Stand looks like someone started to draw a chair in Microsoft Paint, did a bad job, and gave up. Google’s wireless charger only comes in white, which seems like a missed opportunity. Google could have offered versions that match all the Pixel colors. The underside has an unexpected splash of color—it’s sort of coral, I guess? Near the back, there’s an opening and a recessed section where you attach the USB Type-C cable. The hardware is covered top-to-bottom in soft-touch plastic, which keeps the phone from sliding around too much when you drop it on. The bottom lip that keeps the Pixel from sliding down has a scalloped edge, which is a bit weird. There’s nothing stopping the phone from sliding side-to-side, so you have to avoid jostling the stand. Your Pixel 3 charges at 10W when on the Stand, which the phone reports as “Charging rapidly.” Although, that’s 8W slower than you’ll get with the cable, and 5W slower than Samsung’s wireless charger with its phones. A small hidden LED lights up on the front of the Pixel Stand when you dock your phone to let you know it’s connected. The Stand charges any phone with compatible wireless technology (Qi), but the custom Google features only work with the Pixel. 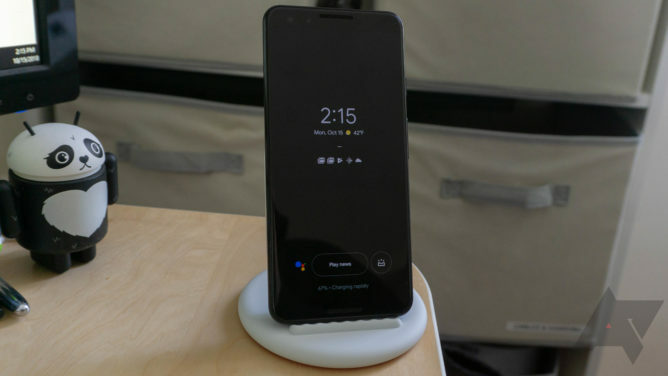 The Pixel Stand piggybacks an identification signal on the wireless charging waves using a technology designed by Google. That means your phone actually pairs with your Pixel Stand automatically—no Bluetooth or NFC required. When docked, your phone activates always-on Assistant listening, and it can offer suggestions (via a button on the screen) like playing the news or reading your messages. 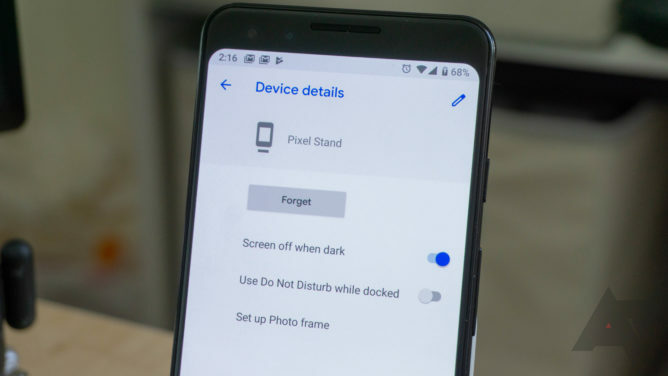 In the Pixel Stand dock, you can rename your stand, and configure it to activate do not disturb, turn the screen off at night, or show recent photos automatically. It also integrates with the Nest Hello doorbell. The box doesn’t contain anything unexpected. You get the Pixel Stand, a USB C-to-C cable, and a plug. The charging apparatus can do 18W charging if plugged directly into your phone, so I imagine it’s identical to the stock charger you got with the Pixel. Probably not. I applaud Google for adding wireless charging to its phone again, but the Pixel Stand is just too expensive to compete with all the bargain-basement charging pads that use the same Qi technology. Google’s custom features are neat, and they do improve the experience. However, they’re not worth the exorbitant $79 asking price. I like that dropping the Pixel 3 on the Stand can turn on features like always-on listening and photo frame mode. 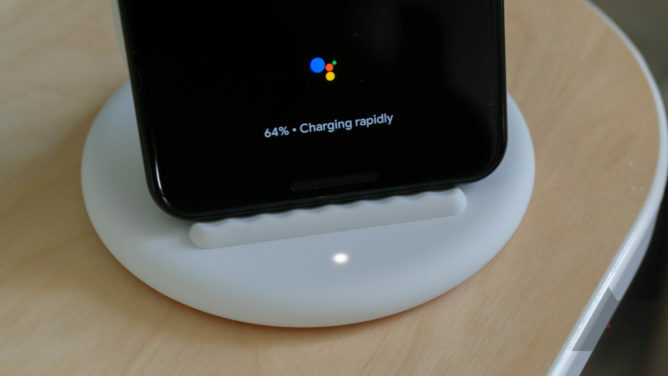 The way Google identifies your Pixel Stand via the charging signal is undeniably clever. You can even have multiple Pixel Stands (eg. one at home and one at work) with different settings. It’s easy to fit on a cluttered desk as well because it has a small footprint. It’ll blend in with your setup because it’s an unremarkable device. The Pixel Stand not elegant or interesting—it just is. The soft touch surface keeps the phone from sliding around, but I’d feel more secure if there was something to keep it from sliding side-to-side—the scalloped lip doesn’t seem like enough. If you start buying multiple Pixel Stands for home and work, the cost will add up quickly. The price is just too high when there are well-rated chargers that can do 10W for much less (like this and this). Even Samsung’s fancy fast charger is about half as expensive as the Pixel Stand. You could argue that it comes with a Pixel fast charger, and that’s $35 all by itself. However, you’re just going to leave the stand plugged in all the time, and Google’s wired chargers are also pretty overpriced. Previous Post Bitcoin Price Analysis: Did We Just Get a Reversal Sign?